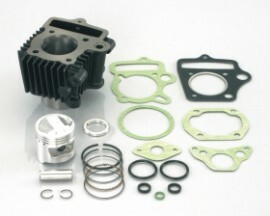 Kitaco 75cc Light Big Bore Kit for a Stock Cylinder Head to suit short rod engines including the Z50A, Z50J1, Z50JZ, ST50 models. Easy Torque Power Increase with Less Expensive Cost. Please Note: For 6 volt Z50's and Other Honda Z50 model short rod engines running the stock Honda OEM larger combustion chamber cylinder head.